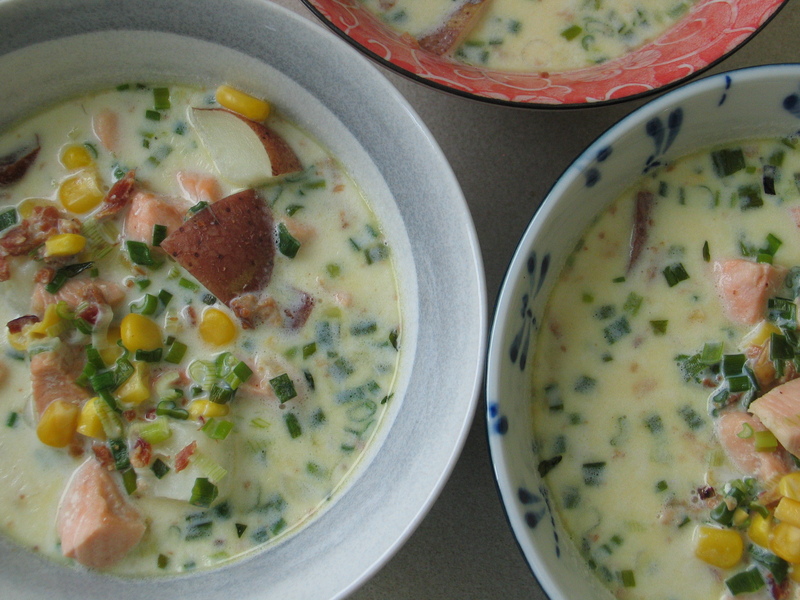 Borrowed from ‘The Epicurious Cookbook’, this is a similar broth to both Bacon and Corn Chowder and Edamame Corn Chowder, but the salmon is a really lovely change-up. I used frozen, wild salmon – significantly cheaper, slightly fishier tasting, but I’m fine with that for a soup – and if everything is prepped, this is definitely a quick week-nighter. Enjoy! In a large pot, cook the bacon until crisp, then remove the bacon to a paper-toweled plate to drain and pour off all but about 2 tablespoons of bacon fat. As the bacon is cooking, boil the potatoes in salted water for about 8 minutes until just tender, then drain and set aside. 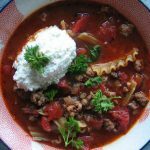 To the large pot with the bacon fat, add in the green onion, corn, garlic, thyme and red pepper flakes and cook over low heat for a few minutes until the onions are tender, then add in the milk and bring the whole pot just to a boil while stirring regularly. Add in the salmon, salt and pepper, bacon and potatoes and cook, stirring carefully for about 5 minutes until the salmon is cooked through and flakes easily. Taste for salt and pepper, stir in the lemon juice and serve it up with the garnishes of your choice. We highly recommend it with the Parmesan foccacia!